CORAL Volume Volume 12 Number 5 Cover Preview. Images by Than Thein. • Undemanding (species that do not require the latest technology for lighting, current production, and maintaining pristine water quality). Than Thein, highly regarded coral culturist from Ohio will share his secrets and mix in some rare and unusual corals that even experts may find surprising. SIDEBAR ARTICLE: System Checklists — The Parameters to know (and remember) when keeping SPS corals: water flow, lighting, system control, filtration, maintenance do’s and don’t’s. Other Features: Behind the scenes at the Smithsonian Institution’s showcase IndoPacific Coral Reef System: Designer Jeff Turner details how it was conceived, built, and stocked to become “America’s Reef Aquarium” • Featherdusters: If Worms Could Fly: Dr. Ron Shimek explores the biology of fanworms, often dazzling beauties but one of the ultimate feeding challenges in the aquarium • Breeding Feeder Shrimp: simple methods for raising your own Mysis and freshwater Sulawesi Caridina Shrimp. • And much more: diving Baja California, Good Algae, Banggai Cardinalfish breeding revisited, Rarities, glorious reef photography and always something unexpected. 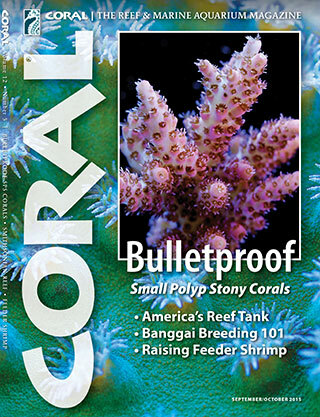 The September/October 2015 Issue of CORAL will be arriving in homes and stores during the last week of August and first days of September 2015. Subscribers can anticipate at-home delivery of print copies at the end of August, followed by email links to the simultaneous Digital Edition. Subscribe to CORAL or buy Back Issues here.